Over the weekend, I received a care package from my good friend Reid, the co-owner and “jerk master” of Munchie’s Take a Lickle Taste, a stellar Jamaican restaurant in South Orange, New Jersey. Inside was a gigantic bag of Betapac Curry Powder and about a dozen packets of Grace Fish Tea mix. 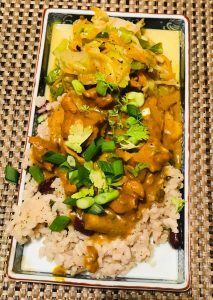 I quickly got to work preparing the Holy Trinity served up in every Jamaican restaurant from Kingston to Brooklyn to Toronto to, well, Tokyo itself: Curry Chicken, Rice & Peas, Steamed Cabbage with Carrot. Armed with good Thai coconut milk, a big bunch of home-grown thyme and a few Haberno peppers (Jamaican Scotch Bonnets were not to be found), my meal was total success: The curry was luscious, layered with flavor and hints of all spice and thyme; my rice and peas were creamy; my cabbage had snap and liveliness. Best of all, I had all the “gravy” I liked without the disdainful tooth-sucking that often accompanies said request at a typical Jamaican restaurant. I learned how to make my preparation in Kingston years and years ago. 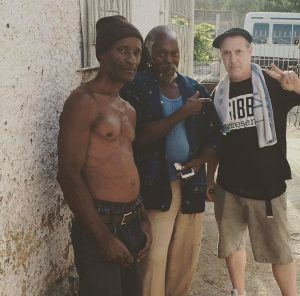 Back then I was travelling to Jamaica up to five times a year, buying old records and licensing music for my old record shop. My home base in those years was the Freedom Sounds Headquarters in a part of downtown Kingston called Greenwich Farm. I stayed there as a guest of Freedom Sounds’ label owner, Betram Brown, who was tragically killed in 2008. A completely heart-breaking event for me. Contrary to the stereotype of “No Problem Mon,” the Jamaica I knew had lots of problems — poverty, police violence, guns, economic instability and so on. It was also hard work. I would wake at the crack of dawn, head out to appointments I had made. Most days, I was on the road from morning to late-night, extracting records from chicken coops, arguing with criminals-turned-record-dealers and playing the never-ending Jamaican game of “Soon Come, Never Come.” Food was always an after-thought. Maybe, some boiled banana and rice in the morning and a random curry goat or jerk chicken picked up road side during the day. Night comes quickly to a ghetto neighborhood like Greenwich Farm – when the sun goes down, people mostly stay locked behind their gates, no restaurants, no shops in sight. I often ended the day, stomach empty, nursing a warm Red Stripe, enveloped in the burning smudge of lit coils of “mosquito killer” while watching Kung Fu movies on an ancient black and white television. My companion during those late-nights was Fred Allen. Fred was tall and grey-bearded, his face remarkably smooth. His dreads were enormous, always bundled — about the size and shape of a good-sized backpack. He was, what would be called in Jamaica, the “Gatesman” of Freedom Sounds. Like many Jamaicans of his age, Fred could do everything: he painted incredible murals; he could fix anything from cars to bicycles to refrigerators and turntables; he once, with a patience that I cannot even imagine, took a needle and painstakingly ran it through the grooves of a 45 that I thought beyond hope, rendering it playable; with wood scraps, he crafted record boxes; he hand-folded and glued together thousands upon thousands of LP sleeves; he was a singer; unasked, he would wash my shoes every night, leaving my grubby sneakers dazzling white in the mornings; and, while silent for the most part, he was ever-vigilant and kept Freedom Sounds safe for everyone, but especially for me (even though he once cackled for a half hour as I dived onto the floor as a burst of automatic gunfire popped off up the block). He could also cook. Really cook. When I was lucky, I would catch one of Fred’s meals. If the fisherman passed by the house with tiny sprats and saber fish, Fred would roast them over a fire on a piece of zinc pan, dressing them with salt water and crushed pepper. His timing was impeccable. With vegetable scraps, a cup of rice and some canned mackerel, he could come up with something delicious. One day, for reasons I can no longer remember, we decided to have a party for the block. I took care of getting liquor and gave Fred money for food. When I returned with cases of Red Stripe, Guinness and over-proof rum, Fred was in the midst of prep-work. He had four freshly killed chickens, a cauldron of rice and peas at the ready and piles of veggies: garlic, onion, pumpkin, callaloo, scotch bonnet peppers, cabbage and freshly prepared bowls of coconut milk. I watched Fred as he carefully built a fire in what looked like an old truck wheel. He seasoned and browned all the chicken in hot oil and then carefully built up a roux with fragrant curry powder, garlic, ginger, scallion and onion. He then slipped the chicken back into the pot with potato, whole scotch bonnets and pumpkin, a bunch of thyme and some other secret herbs; finally he dumped all the coconut milk in and let the whole thing simmer away at a lazy boil. In the meantime, neighbors brought over a sound system, all the Greenwich Farm boys helping out hoisting the huge speakers on their backs or pushing them along in hand-carts. As they tuned their boxes, getting the sound just right, I sat with a young man, whose name I now forget, helping him out by juicing a variety of fruits which he would later mix with rum. He was a quiet kid, very guarded, draped in the uniform of a “Bobo Dread,” He had grown up in New York from the age of 3. At 18, he got busted for selling weed in Washington Square Park and got deported back to Jamaica, a country he barely knew. But, as we mashed the fruit he loosened up and finally, with the grin of a 12-year-old, asked me how the Yankees were doing. “I really miss baseball,” he confided. He was a Yankees obsessive, enamored by the teams of the 70s and we spent the next hour speaking of the grace of Mickey Rivers, the devastating arm of Sparky Lyle, the leaping catches of Craig Nettles and that annoying photo of Bucky Dent in a half-shirt. In time, everything was ready and Fred presented me with a heaping plate of rice and peas, curry, steamed bok choy, cabbage and callaloo. The wood smoke had infused itself into the base notes of everything it came into contact with. The chicken itself had real flavor — the expression of a natural diet of grubs, roaches, centipedes, ants, lizards and whatever else could be pecked at in the hard-packed dirt of a Greenwich farm backyard. It melded perfectly into the velvety sweetness of fresh coconut milk; itself shot through with the blazing, yet fruity, heat of the scotch bonnets. The rice and peas could have been a stand-alone meal. The grains had integrity and the flavors asserted themselves as the perfect bed for all that delicious curry gravy. The bok choy was buttery and the cabbage and callaloo retained a freshness, a vitality so often lost in the steam tables of many Jamaican restaurants. All of it came back in a flash, sitting around my new table in my small Tokyo home, my son’s fingers stained yellow with turmeric as he helped himself to a second portion. I would have never imagined my travels as a youth nor imagined that I would have ended up living in Japan. These are mysteries that are still unfolding. If I try to make any sense of it, I can’t. My life, from the moment of inception, seems random– generations upon generations that preceded me making fortunate slips and narrow escapes, all coming down to a chance meeting between my mother and father, which led to my birth nearly fifty years ago. What doesn’t seem random are all those people, all those ideas that I carry with me and effect every day of my life. No matter where I am, a package can arrive from a dear friend, and even in the heart of Japan, I can unpack my memory and once again be sweating in the heat of the Kingston ghetto. My hands are guided by the able skills of Fred Allen, and I am allowed to feed my family with the same love that was shown to me in yet another world that was not my own. What a great read, Jeremy. I’m a former Deadly Dragon customer who would come up occasionally from DC and now I’m happy to have somehow found this blog. By what pathway, I can’t remember. Rabbit holes, etc. Thanks for sharing your memories.